A new paper in AJHG discusses the distribution of chromosomal segments of distinct ancestry (CSDAs) under three different models of admixture dynamics (left). 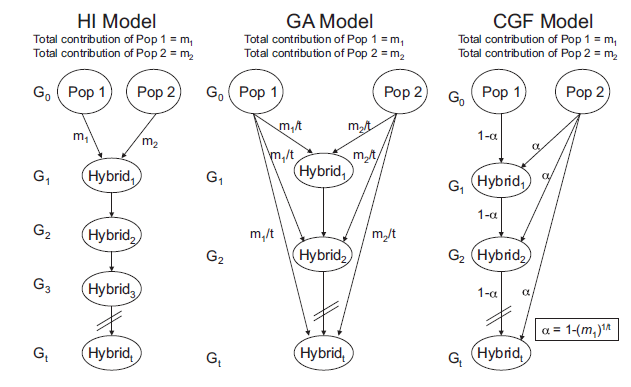 In the hybrid isolation (HI) model, admixture is instantaneous and results in a hybrid population that evolves with drift and recombination only. 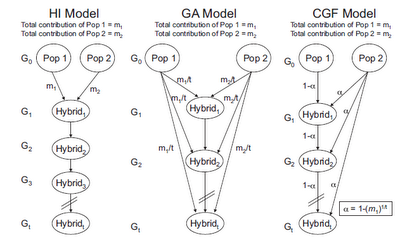 In the gradual admixture (GA) model, the hybrid population continues to receive admixture from the unadmixed parental populations. Finally, in the continuous gene flow model (CGF), one of the populations becomes admixed while the other continues to exist unadmixed and to contribute to the admixed one. In practical terms, the HI model results in the diminution of CSDA length due to recombination over time, and at "present" there is a paucity of long CSDAs. In the GA model there are more long CSDAs for both populations, while in the CGF model there is an asymmetry in the CSDAs donated by Pop1 and Pop2, with those from the "donor" population being longer (because fresh "long" segments are added in every generation). Although the actual population admixture of African Americans might be more complex than what our simulation suggested, the CGF1 model setting at 14 generations was found to be reasonably epresentative, capturing the main pattern of the population admixture dynamics. The CGF1 model has Africans as recipients and Europeans as donors. This makes sense, since African Americans are descended from slaves who were transported to the New World, with the slave trade ending centuries ago, hence there was mostly no replenishment of the AA population with fresh African-origin individuals. On the other hand, European Americans, both due to social dynamics and their numerical majority continued to exist as a distinct population that contributed to the AA population. I should mention that according to HAPMIX, the admixture time was 7 generations, with is close to the 6 +/- 1 generations inferred by rolloff analysis by Moorjani et al. So, in this case this admixture time appears to be an "average" of a continuing process of admixture that began 14 generations ago. In short, the GA model at 24 generations fit the empirical data best among all these simulated scenarios, as indicated by the distribution of EMDs. Again, this makes sense, because in Mexico there continued to exist unadmixed populations of Europeans and Amerindians that contributed to the Mestizo population of the country. Comparing the empirical distribution of CSDAs with that simulated, we found that the Mozabite admixture process essentially fit the HI model with 100 generations since admixture. There was an almost complete absence of recent gene flow from European populations to the Mozabite gene pool (Figure 6A). For the Sub-Saharan African ancestral component, there were more long CSDAs at the tail of empirical distribution than those in the HI model, which confirmed that recent gene flow from African populations had contributed to the Mozabite gene pool (Figure 6B). Again, this makes sense: Berber groups were not replenished from other Caucasoid sources, so their original admixture with native Africans resulted in a blend that persisted largely unaffected by "Europeans", but did find occasion of admixture with Sub-Saharans. Hence, the asymmetry in the presence of long "European" vs. "Sub-Saharan" segments. Analyses of European ancestral component in Bedouin and Palestinian populations also showed that the empirical distributions essentially fit the HI model for both populations (Figures 6C and 6E). Although the empirical CSDA distribution of Sub-Saharan African ancestral component also fit the HI model best, both distributions showed a long tail at the right compared with those under the HI model, indicating that recent gene flow from Sub-Saharan Africans also contributed to the two admixed populations (Figures 6D and 6F). ... For Druze, their European component of ancestry fit the HI model very well. However, their African ancestral component contained much shorter CSDAs than those of simulated (Figure S14), which might indicate that previous studies had underestimated the admixture time of Druze. In addition, populations receiving recent gene flow from their parental populations showed higher variation of individual ancestral proportions than those who did not (Figure S13). The Druze have well-known Egyptian connections, and they may have largely avoided Sub-Saharan African admixture during the Islamic period, principally because of its avoidance of proselytism. Hence, their African admixture may stem from Egyptian adherents who were themselves a product of much earlier Caucasoid/Sub-Saharan admixture during the course of pre-Islamic Egypt. The processes of genetic admixture determine the haplotype structure and linkage disequilibrium patterns of the admixed population, which is important for medical and evolutionary studies. However, most previous studies do not consider the inherent complexity of admixture processes. Here we proposed two approaches to explore population admixture dynamics, and we demonstrated, by analyzing genome-wide empirical and simulated data, that the approach based on the distribution of chromosomal segments of distinct ancestry (CSDAs) was more powerful than that based on the distribution of individual ancestry proportions. Analysis of 1,890 African Americans showed that a continuous gene flow model, in which the African American population continuously received gene flow from European populations over about 14 generations, best explained the admixture dynamics of African Americans among several putative models. Interestingly, we observed that some African Americans had much more European ancestry than the simulated samples, indicating substructures of local ancestries in African Americans that could have been caused by individuals from some particular lineages having repeatedly admixed with people of European ancestry. In contrast, the admixture dynamics of Mexicans could be explained by a gradual admixture model in which the Mexican population continuously received gene flow from both European and Amerindian populations over about 24 generations. Our results also indicated that recent gene flows from Sub-Saharan Africans have contributed to the gene pool of Middle Eastern populations such as Mozabite, Bedouin, and Palestinian. In summary, this study not only provides approaches to explore population admixture dynamics, but also advances our understanding on population history of African Americans, Mexicans, and Middle Eastern populations. (Explaining the Neandertal admixture paradox via long-running but very infrequent admixture). I have always envisioned both populations living in close proximity for a long time but only rarely interacting and interbreeding. I suspect a similar pattern will emerge for Denisovans as well.